Sponsored by Richmond Olympic Oval, T&T Supermarket, Vancouver Foundation and TD Bank Group. Food and Fun for the Entire Family! 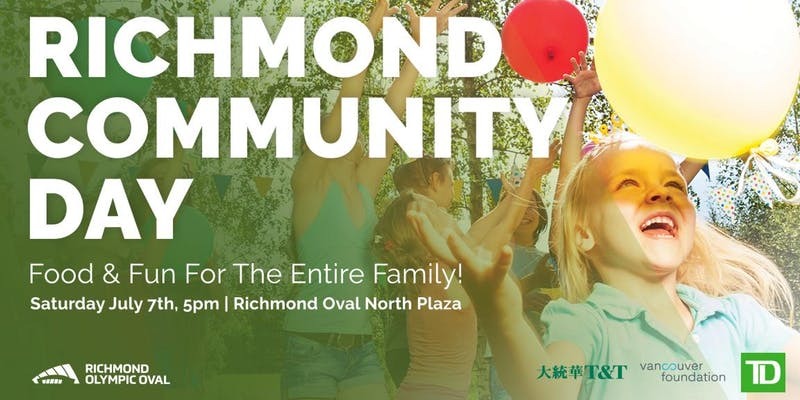 Do you live in the city centre of Richmond, B.C.? Community days facilitated by residents are rare and since many residents live in isolation, the goal of this "block party" is to encourage everyone to close the isolation gap. We hope this event will deepen neighbourly trust, respect and co-dependency so that everyone can depend on one another for the well-being and flourishing of their neighbourhoods. On that day, we will be providing a fun family-friendly environment to encourage face-to-face contact and real conversations among our neighbours. We will also have local non-profit organizations reveal the various needs of the community and provide space and opportunity for our Musqueam neighbours to educate all of us on the importance of being good stewards of the land we live on. Some of our activities include a sidewalk chalk drawing competition, bouncy castle, life-size hungry hippo game, live music, a magic show, games, beach volleyball, hot dogs, ice cream and popcorn. We will also have the Richmond RCMP Police Car! All free for everyone in the community to enjoy!